Your online (Internet) visibility is vital as an NGO or non-profit 501c(3) company. Not only does increased visibility drive your access to resources and funding by increasing your potential resource pool, visibility also makes it easier for you to work with the communities your organization was founded to benefit. No matter what your organization’s immediate motivation happens to be, a good grasp of basic SEO tactics and their application to non-profit companies’ operational models is an essential investment of your time and, if needed, your budget. Not only does it help you achieve greater visibility faster than other marketing methods generally do, it also tends to have a much lower cost for the reach. If you know you need help with your Internet Marketing, but don’t the time, expertise or inclination, please consider giving Big Oak a chance to talk with you about how we can help. You can call me, Shell Harris, directly at 804-212-2981. I’m the co-founder of the company and I will be delighted to speak with you about the benefits of SEO and PPC for your non-profit company. No pressure, just questions and answers. When discussing marketing costs in terms that are appropriate for non-profit companies, return on investment is probably your most important metric. As a measurement, it is typically the estimated time it takes for a campaign to begin making money for the company. It’s no less important for non-profits to think in these terms when running campaigns aimed at donations, but when doing outreach and awareness, it is likely to be less valuable than your understanding of costs per thousand impressions and conversions. At Big Oak we track all these metrics so you know if your money is being used most effieciently. The cost per thousand impressions, or CPM, tells you how the costs of each digital campaign stack up to each other and to your offline marketing efforts. When compared to the conversion rates that each method uses, it becomes easy to understand how many actual points of contact you make for the cost of each campaign, allowing you to make good strategic decisions about where to reinvest to get the best use of your resources. With this information, changes can be made each month, or week to adjust campaigns, both SEO and PPC to maximize results. Traditionally, online marketing efforts have much lower CPM than offline marketing, sometimes exponentially lower. They also tend to have lower conversion rates, but in the final calculation they still cost less per contact than offline marketing efforts. When you add in the fact that non-profits can take advantage of exclusive programs like the Google grant for “free Adwords,” the costs become negligible. We will talk more about those resources later and how Big Oak can help you take advantage of those resources that are low-cost or free. No guideline of basic SEO tactics would be complete without noting that all of your digital marketing efforts should reinforce one another. That means a healthy boost to your traffic from a well-managed mailing list will help it rank higher, making your SEO more effective. Similarly, great SEO will drive people to your mailing list where you are likely to enjoy higher conversions on your campaigns because you are writing to a friendly audience. Don’t have a mailing list yet or need to build bigger list, Big Oak can help start your list or increase subscribers. Search Engine Optimization is usually part and parcel of your company’s web design package these days, but this type of SEO is usually non-existent and poorly managed at best. You should be using a separate service if you want real results and a true SEO consultant watching your campaign. This involves three basic strategies, keyword optimization of your content, adding relevant content on a monthly basis, and the creation of links to your site from other relevant websites. Content Marketing is useful both for social media growth and for SEO, because it creates more keyword-optimized content for your site, usually through blogging. It also helps create links back to your site through the creation of content for other venues that credit your organization by way of a link. This strategy requires new content with topics that are strategically selected and both lengthy (think over 1,500 words) and in-depth. Pay Per Click (AdWords) Advertising can be done through search engines or on social media. Useful advice for PPC tends to emphasize the need to balance your investment in search engine PPC and social media PPC based on which is currently getting you the best return. Big Oak recommends Google, especially for non-profit companies that can take advantage of the Google Grant program (see further down). Facebook advertising should be used with caution and daily monitoring. Targeting marketing is available on Facebook so you can push your message to very niche groups. Social Media Marketing involves building a platform that consists of various social media accounts on different services and building up your following. This is a strategy that needs to be entered into lightly and then tracked for effectiveness. Social media sites such as Facebook are very difficult to see dividends from without the use of effective paid advertisements. This means you need to track costs closely. Email Lists are the last step in most digital marketing campaigns because they have a great return on investment, but they need to be supported by a marketing campaign that makes them highly visible. Bringing more visitors to your site is key to building an email list and the bullet points above should always be increasing your email list and your potential reach. PPC (paid search) or AdWords converts high, but you shouldn’t overlook over traffic sources. A good “portfolio” of marketing tactics is usually best. Most companies, whether they are non-profit or for-profit, begin with a focus on content, SEO, and social media with support from PPC advertising as backup for building awareness. That’s because PPC is the key to generating your initial traffic, whether it is for likes on social media or click-through traffic in a search engine. Luckily for your 501c(3) organization, Google has created a program that provides non-profit companies with a tremendous opportunity: a grant program for up to $10,000 per month in AdWords credit for PPC advertising. Silicon Valley tech companies love to position themselves as agents of social change, and Google is no exception. What makes their program exceptional, though, is the way it positions Google’s core company resources as part of the support program for charities and nonprofits. The Google grant for “free AdWords” allows the Google to open access to its powerful advertising program to the charities that need it most, providing up to $10,000 per month to support online PPC campaigns that raise their visibility and help connect people to their resources. 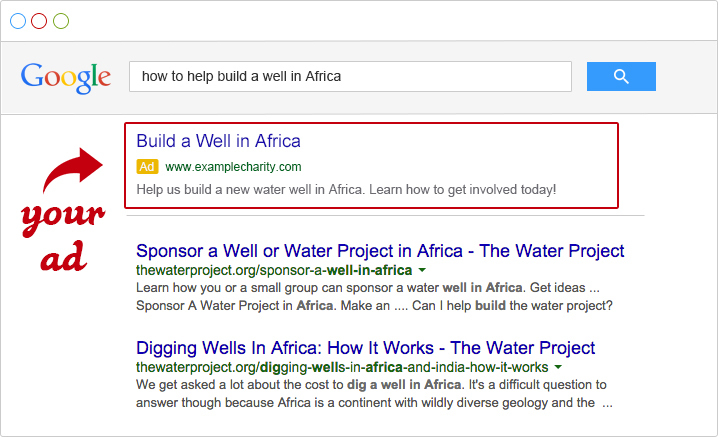 Example of how a Google Grant advertisement displays. To apply for this grant, an organization must first qualify as a non-profit, something that begins by checking the company’s guidelines. If your organization doesn’t currently fit the guidelines, there may be steps you can take to change that. For example, many NGOs start out through private donations and then file for full 501c(3) status when their activities hit a “critical mass” and the organization needs to achieve official recognition to keep growing. If that is the case, investing in finishing the paperwork for your organization means gaining the ability to access grants and resources beyond just the Google grant, so it’s a good idea to expedite it. Google also requires companies to log in and manage their accounts regularly (this is where working with an Internet marketing company such as Big Oak Studios is critical), with at least a once-monthly login and a change to your campaign once every 90 days. There are other core qualifications that have to do with the use of the resources provided, and before applying for a grant to start your campaign, it is vital that your organization fully understand the program. Big Oak will make sure you do everything correctly to be awarded access to the Google Grant program, for a minimal one-time fee. Most companies and organizations use some DIY tactics to kickstart their digital marketing, and many continue to apply those tactics to some aspects of their digital campaign as they move forward. There’s a lot to recommend the personal touch, but there is one major shortcoming to most do it yourself approaches. That shortcoming is data analysis and campaign modifications that an Internet Marketing company can provide. As your online marketing efforts get more complex, analyzing the trends in your campaign’s successes and shortcomings becomes more and more important as well as making changes to capitalize on the trends or stop campaigns that are eating into your budget. Once you achieve a high degree of success and your investment in digital marketing grows to encompass the full list of strategies outlined above, it will become important to have that guidance and feedback, and winning a Google AdWords grant means accessing the kinds of resources that will bring your online marketing to the level where you need the analytics. Remember, the Google Grant will require monthly maintenace or you will lose it. Big Oak can manage this monthly work for a very reasonable fee. If you are going to get the most out of your non-profit company’s access to PPC campaign funding through the Google Grant program, you need to go in with a strategy for your entire digital marketing effort that puts PPC in a prominent position and supports it with an investment in the additional digital channels that deliver the content and resources your audience needs. That means investing in writing content that provides useful information to your audience base while also helping your SEO. If you work with a company that understands both Google and non-profits, you can get end-to-end help with your online marketing that makes your expenditures and your grant dollars both go further. Here is a brief list of benefits that the right digital marketing support can bring to you. If you are going to make the investment in qualifying for the Google AdWords grant for non-profits, you need to know that your investment is going to bring you the best possible return. Put simply, that’s what teaming up with a marketing firm for your SEO gives you. It gives you the resources to get the best possible return on your investment. You can take charge of your company’s digital profile with basic SEO tactics up to a point, but when you are talking about budgets of up to $10,000 per month in grants plus your other organizational commitments to online outreach, you’re talking about a lot of data to manage. Let your organization benefit from expert guidance. To get the most out of your digital marketing, you need to make sure it is informed by your print and offline marketing and connected to it. That’s where working with an Internet marketing firm that specializes in your kind of organization pays off. Not only do they take care of the intricacies of tracking and optimizing your digital marketing, they can give you advice about how to connect your various methods of marketing to make them all more effective. More importantly, they can also work to keep your web design fresh and approachable, so new visitors from offline channels have an easier time getting around. Big Oak provides design services and can help with press releases and email outreach. In the end, your SEO strategy should be an evolving approach to your visibility, and it should work with all your other methods of advertising and outreach to support your non-profit in every way. That means being able to pivot between different donation drives and providing information. It also means collecting non-monetary support, like petition signatures, as needed to achieve your goals. If you want to achieve that level of sophistication in your use of AdWords and other PPC platforms, you need to work with the people who understand those systems, the same way you hire top video companies and ad firms to take care of television and print advertising. Then, you need to align all of your various teams’ efforts together to get the best results, doing to your overall marketing plan what your digital marketing partner has already done on a smaller scale for your digital strategy. Big Oak can submit and manage your Google Ad Grant. It helps charities target potential interested parties with target and strategic Google Ads, a Google+ page, if your organization doesn’t have one already. Big Oak will also reivew your website to insure it will convert your visitors at the highest rate possible, whether that is for donations, volunteers or awareness. For many companies, digital marketing is the best way to kickstart advertising from the moment they start up. Whether you are operating a charitable organization or a not-for-profit enterprise, this holds true, and it’s largely because there are so many cost-saving ways to bring DIY efforts to digital marketing. When your organization matures enough to qualify for major resource grants like the Google grant for Adwords, though, it is time to move past basic SEO tactics, embracing the kind of aggressive and rigorous approach you can only take when you have expert advice steering your campaigns. Moving past DIY efforts is about more than just scale, though. It is also about identifying the best ways for you to move forward, using the data from past campaigns to make the adjustments you need to follow trends and get better results in the future. There’s no simple replacement for that in the DIY toolkit, and investing in the kind of expert help you would need to perform these analytical measurements in-house is often cost-prohibitive. That’s why your organization needs to work with a firm that understands digital marketing for nonprofits if you are going to get the most out of your marketing dollars—no matter where those funds come from. Give us a call and see if we may be a good fit for your non-profit company – 804-741-6776. Nice blog and very informative share. SEO and PPC both are very important for modern trade and both needs proper techniques to get a positive outcome. Your tips are excellent enough to consider my efforts to get the best outcome for my PPC and SEO strategy formulations without doing enough brainstorming.